Reparto: Matt Damon, George Clooney, Bill Murray, Cate Blanchett, Jean Dujardin, John Goodman, Hugh Bonneville, Diarmaid Murtagh, Sam Hazeldine, Adrian Bouchet, Alan Bond, Adam Prickett, Bob Balaban. 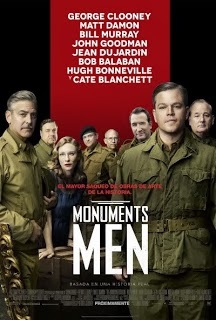 Guión: George Clooney y Grant Heslov, basado en el libro The monuments men: Allied heroes, nazi thieves and the greatest treasure hunt in history de Robert M. Edsel. Producción: George Clooney y Grant Heslov. Montaje: Ruy Diaz y Stephen Mirrione. Diseño de producción: James D. Bissell. Productoras: Smokehouse Pictures y Studio Babelsberg.